When you're running a fashion design business, the number one thing you need to be sure of it your source of fabric. Whilst it's possible to buy fabric from the same shops as everybody else, this tends to be a very expensive way of doing things and it's simply not practical when you're producing lots of copies of the same design. 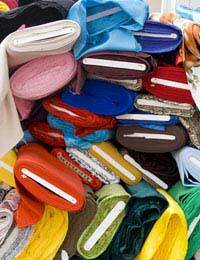 Before you open for business, you should ensure that you have good access to fabric wholesalers. These days the internet makes it easier than ever to locate wholesalers. Because it keeps overheads low, many wholesalers now operate their businesses entirely online. These companies are often able to offer lower prices, but you should take into account any delivery charges when you're working out how much you could save. You should also make sure that you have a good contract which allows for the easy return and swift replacement of any damaged fabric you receive, as you may be handling very heavy bales which it's impractical for you to dispatch by conventional means. Ordering online means you don't get the chance to examine fabric closely before you make choices. Most online wholesalers can send out samples to get around this problem. It's obviously impractical to wait for samples when you need a new fabric quickly or when you want to take advantage of a limited time sale, but building up a good relationship with a particular wholesaler can give you more confidence in the quality of their products and a better idea of what they mean by their descriptions. Getting your fabric from a local wholesaler means that you can examine every item personally before you buy. It makes it easier to meet tight deadlines and it often means that you can buy smaller quantities. Your local small business support centre should be able to give you a list of fabric wholesalers in your area; alternately you can look them up in the business section of your local library. If you purchase supplies locally, you may be expected to provide your own transport, or doing so may make the process much cheaper. Fabric bales can be very large and unwieldy, so a van is usually more practical than a car. Bear in mind that it's possible to rent vans on a short term basis. Newspaper small ads for vans plus drivers often offer a cheap way of doing this. When you visit a wholesaler, you will often be required to provide proof that you represent a business (this is rarely requested during online transactions). Bringing along a business bank statement or a utility bill addressed to your business is usually sufficient. Reliability - Can you always expect the same basic items to be in stock? Can you get access to the same members of staff if you need assistance? Can you be sure of good communication? Quantity - Does the wholesaler supply fabric in large enough quantities to meet the needs of your business? Remember that you may be able to make special arrangements. Variety - Sometimes you'll only want to order one particular fabric from a wholesaler, but usually it's most practical to have the option of getting most of your basic fabrics from the same source. Support Services - How efficient is the wholesaler at delivering supplies and/or helping you to transport what you buy? Pricing - How does the wholesaler compare to others when it comes to price? Remember that the cheapest deal is not always the best, and be careful to check the quality of what you buy. In order to provide a reliable service to your clients, you should make sure that you have more than one wholesale source available for the basic fabrics you need. Even the most reliable companies sometimes unexpectedly cease trading, and the fashion supply market can be volatile. Dealing with wholesalers can be intimidating at first, as you'll be plunged into an environment where everybody else already knows what they're doing and you've still to learn how to spot a bargain. But with patience and a positive attitude, you'll soon get the hang of things. Well established relationships with wholesalers means you'll rarely have to worry about your supply, so you can concentrate on your designs. What to Do if Your Supplier Lets you Down. Is There Any Fashion Design Software That I Could Use? What Should I Charge For the Rights to My Design? Where Can I Get Help to Sell My Designs? Should You Use Professional or Amateur Models? Quiz: How Much Do You Know About Marketing? What are Fashion Shows Worth to Your Business? Developing Your Own Recognisable Style. How Closely Can You Copy Other Fashion Designs? Quiz: Can you Run a Fashion Business? Should you Make Clothes to Fit all Sizes? Hi I need to sell my garment designs.so advice me where I want to sell only my designs.